On Sunday, three new kissing gates were unveiled at Cuerden Valley Park replacing wooden stiles on popular walking routes. The new gates were sponsored by Chorley Ramblers using funds from the Terry Lewis Legacy, and is the first of their Miles without Stiles project . A walk in the countryside is great for the body and the mind but for people with older bones and creaky joints a walk can be a challenge when faced with climbing over a wobbly wooden stile. The new galvanised metal self-closing gates are a safer and easier way but still keep livestock safe in the field. 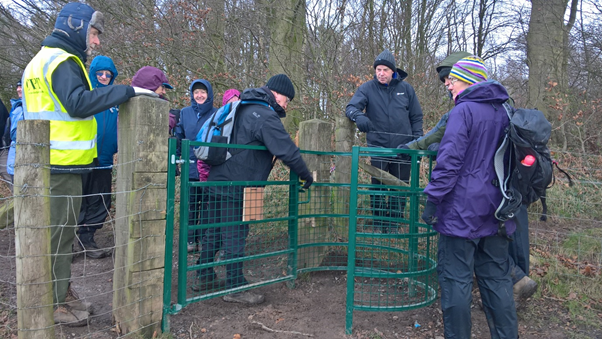 Chorley Ramblers received a small legacy from former member, Terry Lewis, and decided to use part of the money to install some gates and kissing gates on the local footpath network to create Miles without Stiles. “We liked the idea of kissing gates as it seemed in keeping with our fun loving friend, Terry, who so loved walking with Chorley Ramblers. Cuerden Valley Park Trust is the first land owner to get involved and my thanks go to Simon Thorpe, Trust Manager, for his “can do” approach and all his help in delivering this project. The new kissing gates in Cuerden Valley will provide stile free access for walkers approaching the Park from Cam Lane through the field to Gravel Hole Wood, and from Shady Lane to Sheep Hill Lane. A fourth gate will be installed in the next few weeks near the landfill site at Dawson Lane. Chorley Ramblers next stile free route will be in Duxbury where they are working with local land owners, Chorley Borough Council and Grundy’s Lane Management Committee, to achieve this later in 2019.